However, the Bay of Fundy is also a very busy shipping area. About 1,700 ships travel through there each year, heading to and from ports in Nova Scotia, New Brunswick or the United States. Between 1986 and 2005, more than a third of all Right Whale deaths were caused by collisions with ships. 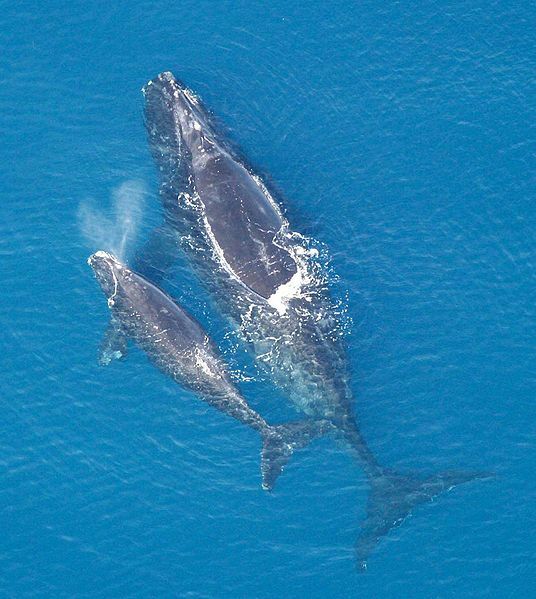 Right Whales spend a lot of time near the surface of the water – resting, feeding or nursing their young. Because they are low, black and slow moving, it’s hard for the crew of a large, fast ship to see them in time to stop. About 15 years ago, scientists from the New England Aquarium in Boston, Massachusetts, and employees of Irving Oil, a company that uses ships to transport oil from its refinery in Saint John, N.B., began looking for a way to prevent collisions. In 2002, they asked the International Maritime Organization (IMO) to move the shipping lanes in the Bay of Fundy away from the whales’ feeding grounds. Shipping lanes are the official routes all large ships are supposed to follow. The new routes, adopted in 2003, are about six kilometres away from the whales’ feeding grounds. It was the first time shipping lanes have been moved to protect an endangered species. There have been no recorded collisions between ships and Right Whales in the Bay of Fundy since then. In addition, more calves are being born. In the past 10 years, the total number of right whales in the region has grown from about 350 to 450. This article was originally published on June 24, 2012. Thanks to some very careful planning and some smart thinking, the endangered North Atlantic Right Whale population is growing. Choose an animal that is either endangered or close to becoming endangered. Using research from books and the Internet, think of some strategies that could be put in place so your chosen animal has a better chance of survival. At school or at home, visit the two websites listed at the bottom of the article. Look through the websites to find out more information about Right Whales. How is reading a website different from reading a story book? How is it similar? Which do you prefer and why? Read a variety of literary texts, graphic texts and informational texts (OME, Reading: 1.1). Read a variety of texts from diverse cultures, including literary texts, graphic texts and informational texts (OME, Reading: 1.1). Read a wide variety of increasingly complex or difficult texts from diverse cultures, including literary texts, graphic texts and informational texts (OME, Reading: 1.1). Why is this the case? Seasons should always be written in lowercase letters unless they are part of a proper name. For example, Summer Olympics is written with capital letters because it is a proper noun (a specific event). If someone wrote about the summer in general (for example, “I love to eat ice cream in the summer“) they would not use capital letters. Write 4 sentences about the winter: two that capitalize ‘winter’ and two that don’t.